Hello again from Atlantic City! 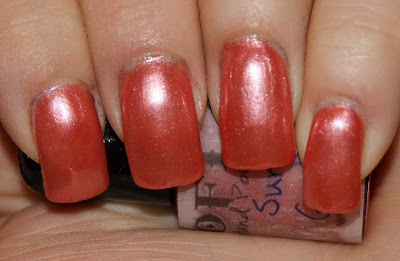 Today, I have for you a GORGEOUS color from SoFlaJo's Life's a Beach collection. How appropriate since I'm at the boardwalk, right? I LOVE this color. It's a beautiful peach nail polish with subtle sparkle and applied like a DREAM. I love the fact that this color has the TINIEST hint of frost in it make it a metallic-sparkle, but just enough that it wasn't streaky. Seriously, Jody continues to surprise me! Plus, I adore the name of this polish. It looks like the color of the sky right as the sun starts to disappear. Amazing. The Life's a Beach polishes retail for $5 for a mini bottle like the one shown above and $10 for a full-sized bottle. There is also a discount for the full collection of minis ($40) and full-sized ($80). They can be purchased via SoFlaJo's shop page or Etsy page. Be sure to check it out!